With my new dehydrator up and running, I’ve been busy. This week, I harvested the last bunch of carrots and they are now stored, dry, in canning jars. 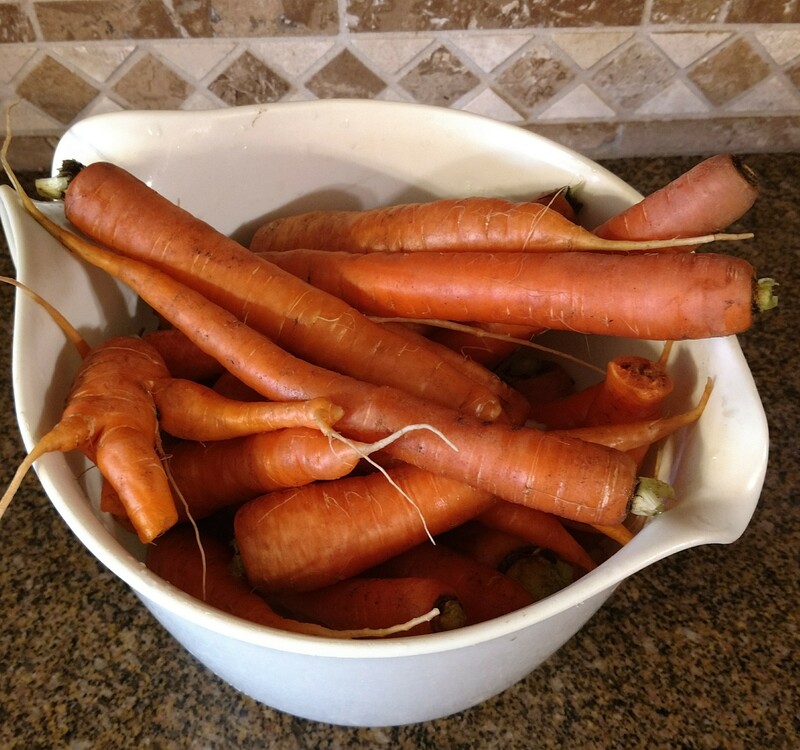 In this blog, I will show you how I prepared, dehydrated and packaged the carrots for storage. Carrots reduce about 90% from the fresh to the dried size (there’s a lot of water in them, remember that they are–after all–roots and their function is to provide the needed water for the green top of the plant.) 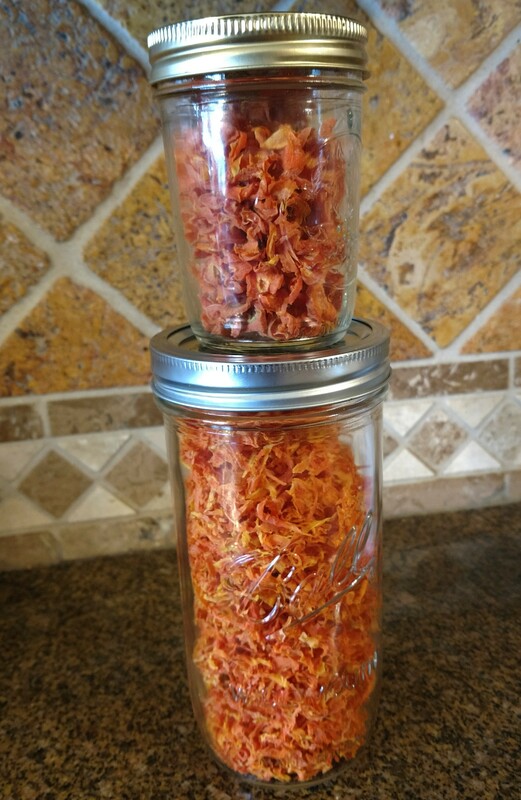 First of all, the jars shown are; 1.5 pints of shredded, dried carrots (bottom) and .5 pint of sliced, dried carrots (top). The total yield from the garden was right at 8 pounds, then the carrots were peeled and the top end cut off, so I suspect this represents about 7.75 pounds of carrots. Harvest, wash, and peel the carrots. Once pulled from the ground, cut of the green tops (or feed them to horses for a treat, mine wait at the fence when they see me in the garden!). I rinse in tap water just long enough to removed soil and plant debris, then rinse in filtered water before drying. I highly recommend filtered water as a final rinse to remove any of the chemicals (there are a lot) of chemicals routinely found in tap water, check your local area water treatment facility to get that information). After the final rinse, peel the carrots — a potato peeler works great! I save the peelings to give to my dogs (most dogs love them!) I had a diabetic dog that loved the carrots, and I’ve given them to all of my dogs since. Drop the carrot peelings into the hot water to blanch very briefly, then pull out and cool on a plate. Refrigerate a few days. The peels can be added to the dog food, or given as a treat. 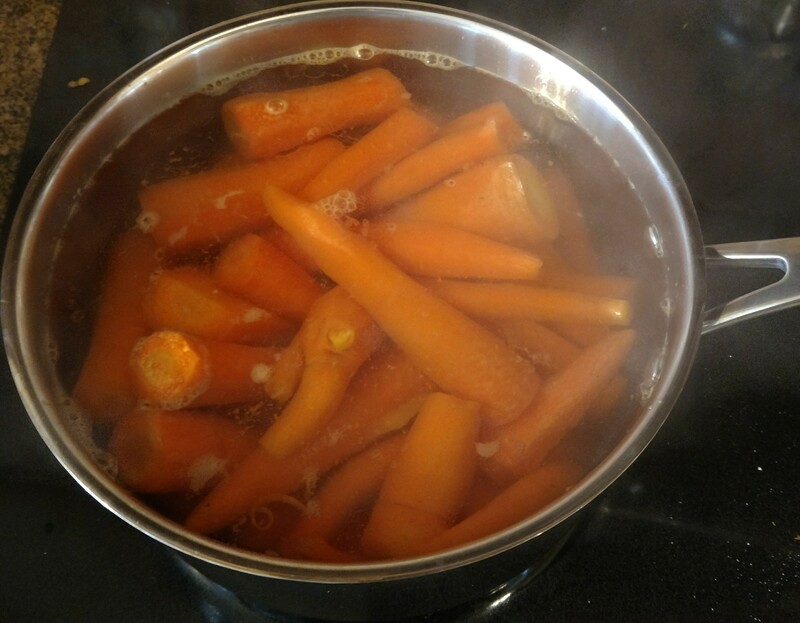 Once the water is boiling, drop the carrots in and start a timer for 5 minutes. Do not boil longer as the carrots will become softened and difficult to slice or shred (they will still dry just fine whether fully cooked or not). Use a slotted spoon to remove the carrots from boiling water and drop into ice water. Let the carrots cool for about a minute, then remove and add to a plate to hold until they are either sliced or shredded. I use a small food processor for this step — simply because it’s easier than pulling out the large processor for a small amount of food items, and then having to clean it up. 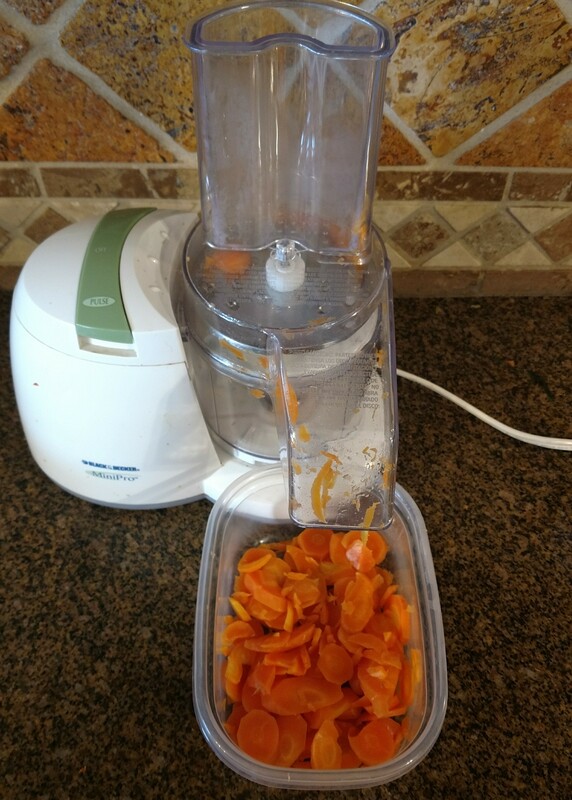 Sliced carrots and the small food processor, shown in this picture. If the carrots do not slice completely, a small paring knife can be used to reduce the “chunks” of leftover material that is too mall to be pushed through the machine. I set the dryer temperature to 125 degrees Fahrenheit, add the trays, and then check the temperature with a thermometer so it can be adjusted as needed. It is important to check the thermometer periodically throughout the process to ensure that there is not a lot of change over time as the materials dry. I find that it is worse to use more heat than less heat because nutrients can be damaged if the optimum temperature is not used for a particular food item. The sliced carrots take longer (about 6 hours in my drier) than the shredded carrots (about 4 hours in my drier). Remove the carrots and cool to room temperature. Pack into desired jars (there are many interesting jar sizes, shapes, and textures to use, as well as the usual quart and pint sized). I find that the tall 1.5 pint jars hold a lot of dried food and I can store more of them on my pantry shelf. Plus, the small .5 pint jelly jars can be stacked on top in most pantry shelves. Chemical packets that reduce oxygen levels to increase storage time can be purchased and added — I don’t usually do that simply because these materials are always consumed within a few months. Add the date to the lid, and place newest items at the back. 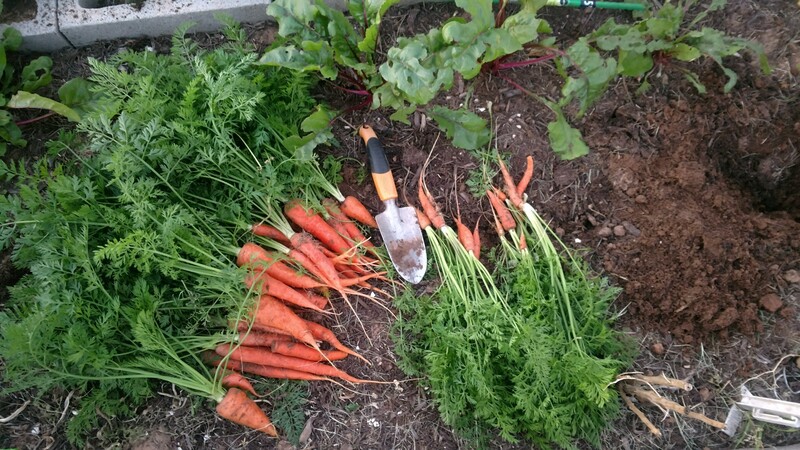 Add the carrots to soups and stews, or boil for a fresh from the garden taste! SIDE NOTE: I also dry Spinach and cook it in water on the stove top—it has no freezer taste, but has that fresh taste that simply cannot be experienced from purchased canned spinach!